Psoriasis is one of the most difficult to treat skincare disorders that can effect a person. It is one of the most common immune-mediated disorders in the United States and it comes in a wide range of forms. Understanding what psoriasis looks like not only helps treatment but also helps to give peace of mind. Scalp psoriasis occurs in about half of those with the condition, although it is not easy to see. Understanding that psoriasis is a common skin condition and is noted by a sudden speed up in the shedding of skin cells' natural cycle helps to understand the disorder. This results in plaques of thick skin cells that look like dry, scaly patches which are often itchy, inflamed, cracked and bleeding. The severity of these plaques can vary from person to person. Some people might experience small plaques while some might have them all over their body. They can appear all anywhere on the skin, but they are most particular to the elbows, knees, and the scalp. In about 50% of the cases, people with psoriasis experience at least one flare up on the scalp. Scalp psoriasis tends to look like small reddish patches that look thick and inflamed, while others might be barely noticeable. More severe forms can extend to the backs of the ears, to the forehead and the back of the neck. Dry scalp is also very common, with cracking and bleeding an issue. Itching is also a common symptom and the scalp often bleeds from the excessive scratching. One might also have soreness or burning. Scratching at the scalp can cause some minor hair loss as does picking at the patches, the hair loss is usually temporary. Interestingly enough, scalp psoriasis is often mistaken for other conditions. The most prominent is dandruff. Scalp psoriasis often comes with flaking and an itchy scalp, both of which are common symptoms of dandruff. However, the main difference between dandruff and scalp psoriasis is that the latter can cause a distinct silver shine along with noticeable dry scales on the scalp. Scalp psoriasis might also be mistaken for seborrheic dermatitis. This is a skin condition whereby red skin is covered with scales that appear to be white or yellow. They may be itchy and have flakes that stick to the hair shaft. The difference being that seborrheic dermatitis can appear greasy or even moist and not dry like psoriasis. Ringworm, which is actually a fungal infection, not a parasite, can also cause a red, crusty rash to form on the scalp. Unlike scalp psoriasis, this rash usually forms in the shape of a ring. The best way to know if you have psoriasis or not is to get a diagnosis from a dermatologist. Your doctor will likely a small biopsy, which can then be examined under a microscope to eliminate potential similar disorders. For example, psoriasis samples generally look thicker and more inflamed under microscope compared to eczema and other disorders. There is a helpful new over-the-counter (OTC) treatment for psoriasis that will help many people. It is called Prosoria. I spoke with the developer and founder of Prosoria the other day to discuss why he developed this product and how it is different than other forms of treatment. Arthur Clapp, a renowned biochemist, has worked in the skincare industry for decades. He used to work for Galderma and helped develop Differin for acne. Prosoria works differently than other products in that first of all it is not a biologic. Prosoria uses natural ingredients to help get rid of psoriasis. Ingredients such as turmeric, salicylic acid, bromelain, etc. It is combination therapy that helps to exfoliate the skin, treat inflammation, soothe and moisturize the skin. 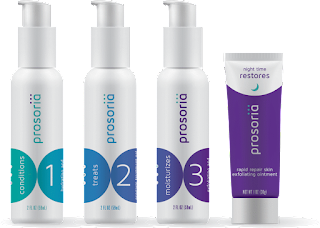 Prosoria is a 4-part system that when used correctly can treat even the most difficult psoriasis. It is OTC (over-the-counter) and can also be used in addition to biologics. The great thing is it has little to no side effects, if anything the only side effect might be some slight irritation. How does Prosoria work? It consists of 4 products that treat psoriasis via combination therapy. Step 1 is a Hydrating & Conditioning Gel has humectants and conditioners that help hydrate and condition the skin to balance it and prepare it for Step 2. Step 2 is Psoriasis Treatment Gel which penetrates the skin quickly to relieve redness, scaling, itching, flaking and irritation and helps to maintain healthy skin. Step 3 is Prosoria Exfoliating and Moisturizing Cream that has a combination of exfoliating and moisturizing ingredients to help restore skin texture and appearance. It gently exfoliates and sloughs off dead skin cells, leaving skin looking healthy, smoother, moisturized and hydrated. Step 4 is Nighttime Restore. This is the Rapid Repair Exfoliating Skin Treatment. It is an intensive skin treatment that boosts and accelerates exfoliation to rapidly restore the skin's appearance by sloughing off dead skin cells while intensely moisturizing. The difference between this and other treatments is that these products have little to no side effects, they do not cause any major organ damage like biologics can do and the system costs relatively little money. The entire system retails for $49.95 to start and can be purchased as a subscription system by signing up and having it delivered as often as needed. You get 40% off your first order making that price go down to 29.97!!!!! It has a 30-day money back guarantee, so if you are not satisfied, then you can send it back and get your money back, no questions asked. Prosoria is currently available on www.prosoria.com and www.amazon.com. Like Prosoria on Facebook: https://www.facebook.com/Prosoria/; Follow Prosoria on Twitter: @Prosoria_; Follow Prosoria on Instagram: https://www.instagram.com/prosoria/ and Subscribe to Prosoria on YouTube: https://www.youtube.com/channel/UC0xeZDlC-rNfjhR6i8HDgfA/featured?view_as=subscriber.